The 17m high Mangapohue Natural Bridge is a must-do New Zealand short walk. Formed by two ancient limestone arches created over millions of years, the bridge is the remnants of an ancient cave system. We highly recommend you visit the Mangapohue Natural Bridge, a limestone bridge archway which consists of two rock arches formed by the Mangapohue Stream in the Marokopa River. The bridge is an incredible 17m high and is the remnants of an ancient cave system. Take the scenic drive from Waitomo Caves Village to the Mangapohue Natural Bridge for a fun, family-friendly walk off the main road. Take the 10-minute stroll to the viewing platform, made of ancient limestone, on which you can view the stunning stalactites on the upper arch's ceiling. This easy walk is perfect for a weekend outing with the family, or in the time between your caving tours. Why not experience one of the other walks on offer in the area including the Marokopa Falls, Piripiri Cave, and Opapaka Pa. When you're at the Mangapohue Natural Bridge, see if you can find the 25 million-year-old fossilised oysters that are exposed in the limestone outcrops! 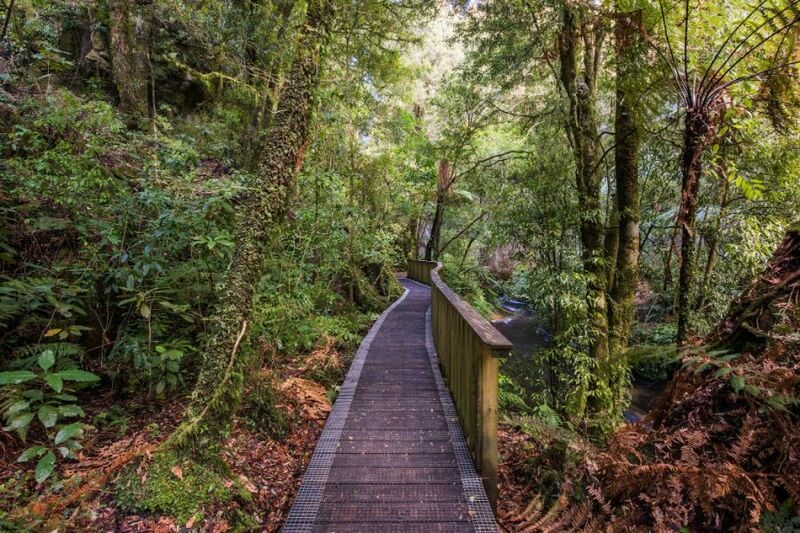 This walk is pushchair and wheelchair friendly to the base of the viewing platform, so anyone can discover, and enjoy, this unique part of New Zealand.